Kyndal interned with the Patriots Point Education Department during summer 2015. We asked her what is was like being a science major at Clemson University. Here's what she had to say. Scarlett is Patriots Point's first-ever "Distance Intern". 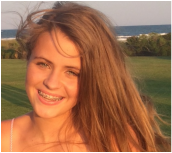 Scarlett is a middle-schooler in Horry County with a passion for science! Learn more about her here! ​Check out her article on the SC Flooding here.